This section of my website is about my hobby of RC planes. I fly electric planes and have been at it for about 2 years. I'm a member of the SWAMPSRC flying club and my planes range from about 14 inches to 55 inches in wingspan. I find building the planes as much fun as flying, and so far I've probably built about 20 planes total. 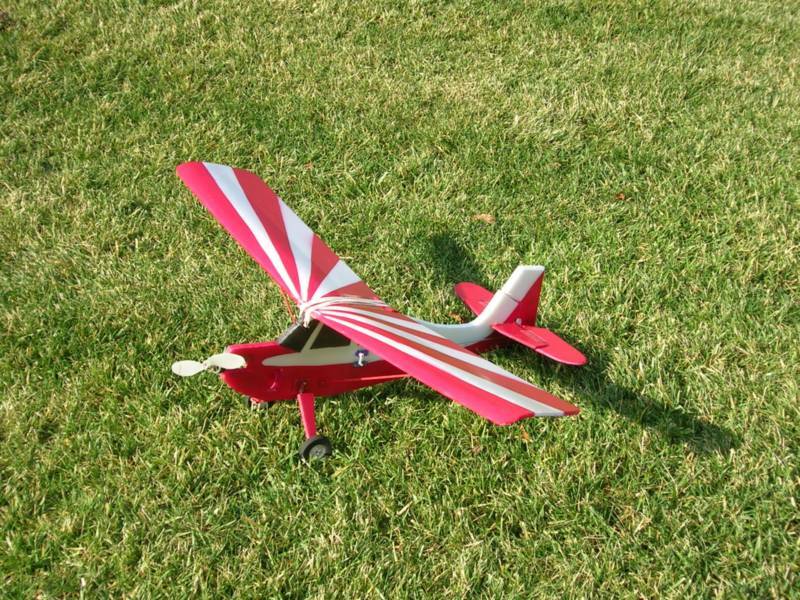 Great Planes Yard Stik - nice flying plane but cheap plastic parts broke too easy. Mountain Models Dandy Sport/GT - fun little plane I lost on a windy day. Going to build another one of these when time allows. Mountain Models Magpie - great trainer and also aerial photography plane. Very robust again crashing (except motor mount tends to break but its a 5 minute repair). Unicorn - nice flying wing, very strong (impossible to destroy I bet). Space Scooter - fun fast plane but was heavy due to my use of NiMH batteries. Crashed and repairs many times until it couldn't be salvaged any more. GWS Slow Stik - great slow flying plane. Pretty forgiving to mishaps. Recommended for beginners - its cheap and flies well on NiMH batteries and 60W of power. STC - built from plans on Internet. Great little trainer plane I love to fly. Radical RC Mini Stick - fun little plane that is a blast to fly with brushless/Lipo hopup. Use good color scheme cause it will get small fast! Carl Goldberg Chipmunk 400 - currently one of my favorites to fly. I have a Hacker A20-20L + Apex 3S-2100 battery and it is ballastic. First plane I've had which I felt I could do some real clean aerobatics with almost effortlessly. Only negative is it doesn't like landing on grass and cowl for engine is really expensive to replace. Extra 330 - built this from plans on the Internet. All 6 mm Depron and is my first attempt at 3D flying. After several horrific crashes its still flying due to the magic of hot glue! Northeast Sailplanes Samba - newest plane and largest. I'm running this with a Hacker A30-12L and two Apex 3s-2100 batteries in parallel. Flies slow or fast. Still learning about this one. 07/14/2006 - Initial posting of this section. Put up some photos of my planes.